I enjoyed reading this book and particularly liked the Fin character because he is brave and when Fin became temporary leader of the village because I didn't know what was going to happen next. I thought the history in the book was very realistic and I want to learn more about history now. I would also like to read more books by this author because he is a very good author. This book is a nice, quick, easy read. It is about a boy called Finn and he is a famers boy ,but he wants to be Viking. Every year Finn and his dad called Ottar went to this island. But this year Finn did not go o Ottar left Finn in charge while Ottar and some fellow village people went to the island. I like that Finn got left in charge and a village far away it takes about a day to get to. My favourite part was when Finn got left in charge, when the sea wolves attacked and someone was a retired sea wolf and went against the sea wolves. The characters in the book were Finn, Ottar, Kjartn, The sea wolves. I thought this book was really good. I was surprised that it had a good story as well has being really interesting for history too. I have lived quite close to the sea so I really liked it that the main characters did too. The words in the books were easy for me so maybe it is for children from 7 years old. I would recommend this book not just to kids that like history but ones that like stories too. I enjoyed reading Attack of the Vikings because it's not just like a boring old history book it's a history book with fun in it and has a really good storyline to it. I thought it was good that lived near a sea because that's mainly where people got attacked in those days by pirates or Vikings and it made the book look really realistic. I found out that in those days pirates were called sea-wolves and that most houses were made out of wood also they go out in the ocean to another bit of land to kill the sheep to eat when they get back. The part I liked the most was when the villagers set traps and then trapped the pirates. This book made me want to read some of his other amazing books as they are very good have good use of language and its fun. I would recommend this book to the age of 7 to 8 years of age because even though it doesn't look like a chunky book there's quite a lot of words in the book (hard words).I really enjoyed this book however it could have had a better ending apart from that it was brilliant! The book was about how Finn's father left him in charge of the village but soon their village was raided. Will Finn able to protect his village from the nasty Vikings? I enjoyed this story because of its exciting plot. My favourite event is when Finn has to fight back the Vikings. The book made me want to find out more about the period of history. The book made me want to read more books by this author because I find them interesting. The gory bits made me shiver! I enjoyed the book because it was surprising, bloody and exciting! Finn lives with his father who is chief of the village. One day his father goes on a voyage and leaves Finn in charge when then the Sea Wolves attack. The story tells how Finn saves the village. My favourite characters are Finn and Kjartan and my favourite event is when the Sea Wolves (who are Pirates) attack. I think the history in the book is realistic because the Sea Wolves were real and they really did raid villages. This book makes me want to read more books by the author because I think Tony Bradman is very good at describing battles and history, especially the gruesome bits. I enjoyed the book because it made me feel like I was there, hundreds of years ago and I felt scared when things went badly. Attack of the Vikings is a gripping, well-written story about a boy whose father is chief of the village. He leaves his son in charge as he goes on a ten day voyage, but then the Vikings attack. My favourite character is Kjartan, because everybody thinks he's just some mad old man that has no family, but actually he has a trick or two up his sleeve. The history was very realistic and the book made me want to find out more and read more by this author. I really loved the book. I was astonished how it this book took over my mind. It was like the time I stayed up til midnight to finish Diary of a Wimpy kid. Finn is the main character and he lives with his dad and step-family in a Viking village somewhere. He is always bored because his dad was a farmer and every year they sailed to other islands to trade with farmers. Fin told his dad Otter that he didn't want to go that year so he was left in charge at home. There was an old man called Kalf who thought this was a bad idea. One morning Fin noticed smoke and asked Kalf, thinking it was a forest fire, but Kalf said a house had been set on fire by the sea wolves and Fin wanted to save it. Fin decided he wanted to be a strong Viking fighter instead of a farmer. I never knew that pirates were called sea wolves. I would like to read more books by this author. 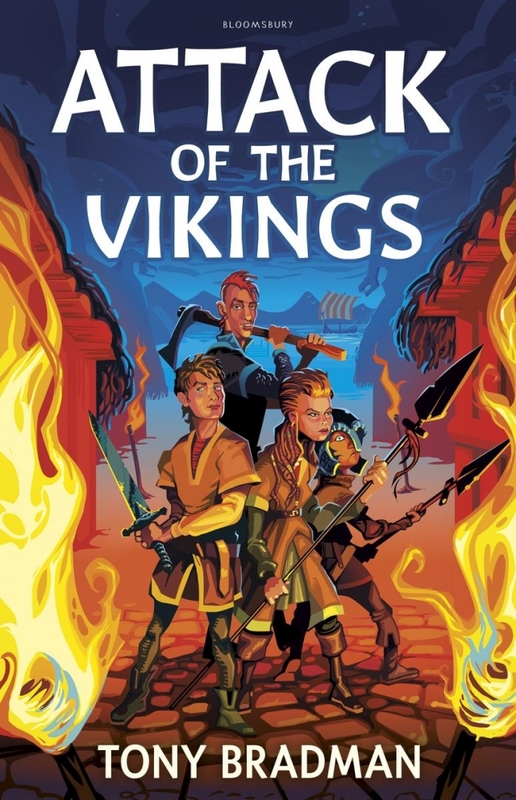 This book is about a boy who wants to be a Viking and a big lord who will lead warriors into battleâ€™ His father leaves him in charge and his village is attacked and he doesn't know what to do. My favourite part of it was when Finn had to decide what he needed to do and the others helped him. Also he proved himself and he was so proud. I couldn't stop reading it. I like Vikings too which was a bonus . I enjoyed the book as is adventurous and I like adventurous books. My favourite character was Finn as he always had dreams to become a warrior. There was not as much history in the book as I thought there would be and so i didn't like the book as much as I could have . However because I like this style of book I would read more books by this author. I think that this is a good book because it is based on a real event in history and as well as being extremely entertaining, also includes many historical facts. I like the at first shy character of Finn who turns into a strong determined person, and the wise and mystic Kjartan who turns out to be a brave warrior. This book isn't as young as it looks, and I would recommend this to adventurous 9 to 11 year olds. I would rate this book 5 out of 5. I enjoyed this book and the most memorable part was when Finn said 'See you tomorrow I hope', because that was a little funny. I don't really have a standout character which I particularly liked but thought that Finn could be funny. Some of the history in this book was realistic, for example there were Gaelic speaking tribes. The book didn't really make me want to read more books from this author, but I would consider more books about this period which were similar to this. I think people who like historical fiction and people who watch Horrible Histories would enjoy this book. I also want to say that this book was interesting from the start. It got exciting near the end when the Vikings attacked the village but lots of the story felt like the author was telling you about stuff that already happened instead of describing it properly so you can see it in your head like we always try to in Literacy. At the end it said 'that is the tale of Finn, son of Ottar' like it was him who had just died, but actually it was Kjartan who had just died and Finn was still a young man and it didn't explain how he grew up. Tony Bradman's attack is a work of art, a piece better than da Vinci could paint. This amazing book held me from the first sentence and made me refuse to put it down. There are many reasons for this one of the most important things in a historical novel is the actual history it was almost bang on the money the words and situations were perfect the sea-wolves and the description was amazing. The situation with Finn, Ingvar, Red Swien and Kjartan was a stroke of pure genius. Since I have read this book I have read another by him which is just as jaw dropping. Overall this was one of the most inspiring books for a aspiring author and I think Tony has got Young Quills in the bag. I very much enjoyed this book, it provided a great combination of learning about history and being entertained with a thrilling read. The way the book was written really made it come to life, I felt as if I really was the main character Finn! My favourite character was Kjartan. I liked the way he used tactical mind to defend the village against the Viking hoards. The part of the book I enjoyed most was when Ranulf was cut down the ruthless Viking leader, Red Swein. The detailed description from the colour of his blood to the way his eyes were wide open as if he were alive, made me feel really immersed in the life of a Viking. I think the book presented a high level of detail of the history of the Viking period but stayed entertaining, cleverly combining fiction and non-fiction. I loved this book and will look out for more books on the Vikings. At the back of the book there is a list of books by Tony and also his brother Tom. I can't wait to read some more and highly recommend them to fellow history lovers as well as readers who just love a good story. I didn't really like this book which was a pity because I have enjoyed Viking books before. I felt that at the beginning it was a little bit slow to start which I found somewhat boring and then when, all of a sudden there was lots of excitement and action, it was described in a way that I found too vivid. The lead character, Finn, is a courageous boy put into a very tough situation. However, if I was a character in the book, I would prefer to be Njal because he is clever and has a good about of common sense to guide him along. I though the book had a good sense of history and help to teach people about what happened at that time between the Vikings and the pirates; it also gave an idea of how the settlements and villages appeared at that time. However, I didn't like that there was too much description into the more gory parts, for example I didn't like phrases like 'Blood gushing out of his neck parts' in chapter 5. I think this put me off - I thought it was good the way Finn managed to understand more about how to live and survive as a Viking warrior, but I was put off reading all the pages because of the detail of the attacks. If you like Viking books, then you should enjoy this - but don't read certain parts before bed! I read the book Attack of the Vikings, by the Author Tony Bradman. The main character is a ten year old boy called, Finn. The book is about a small village ruled by Finn's father, Ottar and Ottar leaves the village on a boat with a couple of people to trade with other Islands. Finn is left in charge for a couple of days. Within that time a tribe named the Sea Wolves came to their own village and tried to burn it down, but Finn and Kjartan knew that they were coming so devised a plan for an ambush. When the Sea Wolves came the people of Finn's village were ready and waiting in the dark. In their hands they had spears, clubs and swords. The Sea Wolves leader, Red Swein was fighting Kjartan. Meanwhile, Finn threw a spear at Red Swein and ripped his chainmail tunic and stabbed him and Red Swein died. The Sea Wolves retreated back to home and their leader was dead. When Finn's Father Ottar came back he is proud of Finn as he saved the village. I enjoyed this book because there were some good characters and the story line kept me wanting to read more. In chapter 2 there was a cliff hanger whereby there was smoke in the village north to where Finn's village was. You don't know where the smoke was coming from and no one knew what it was. It was only when you read chapter 3 that you found out the smoke was coming from a small settlement owned by a man called Andari. My favourite character is Kjartan, who made up the plan when the Sea-Wolves came to invade Finn's village. I would like to read more Tony Bradman books as Attack of the Vikings interested me. I would recommend this book to 9 to 11 year olds. I personally didn't like this book because the description was very repetitive for example; his icy smile .....his icy smile returned again. Although, I didn't mind the characters and their personalities because they are Viking themed and different from each other. Aside from that, the book was incredibly adventurous and I thought there was too much adventure and I didn't really like that part about it either. I must say, I loved the time and place it was set in because there was a peaceful village next to an ocean and a magical forest. If I was going to change this book I would make it that Finn (the main character) would fall in love and they would fight together until one day his love left him to defeat the sea pirates but never came back.